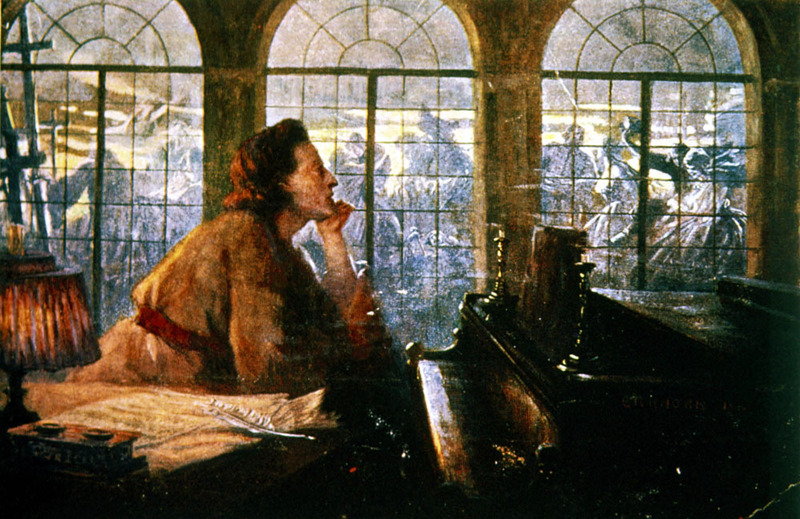 Culture.pl breaks down an iconic piece by Fryderyk Chopin – a composition almost unrecognised by the music society of his times, which is now considered to be groundbreaking and timeless. But why? We take a closer look at Sonata No. 2 in B Flat Minor and find out what Chopin did to push the classical form’s boundaries further than anyone before. Chopin is best known as a celebrated master of piano miniatures. Among his most recognised and often played works we find mostly etudes, preludes, waltzes and nocturnes rather than large-scale opuses. An equally famous friend of his, Franz Liszt contributed to Chopin’s reputation as a master only of easier forms. [I had] an impression that every time [Chopin] tried to fit into classical forms, every time he tried to obey others’ orders, he violated his genius. [Despite Chopin characters’ incompatibility with large-scale works] he came up with a very special, personal way of approaching this form, not to mention all this marvellous music he created on this occasion. Debussy’s words are a closer reflection of Chopin’s intentions. His aim was not to demolish the structure of the sonata, which he knew well and respected deeply, but rather to enrich it without bringing any fundamental alterations to its existing shape. Chopin composed three sonatas for piano solo. His first sonata attempt, Sonata No. 1 in C minor, op. 4, was composed during Chopin’s studies in Warsaw and is regarded more like a ‘sin of youth’ than a successful piece. On the other hand, his two later sonatas, No. 2 in B flat Minor op. 35 and No. 3 B Minor op. 58, are recognised as important points of the evolution of the sonata during Romanticism. Why exactly? We will take a closer look at Sonata No. 2 in B flat Minor and find out where exactly Chopin managed to push the classical form’s boundaries further than anyone else before. Sonata No. 2 was not written all at once. The famous Funeral March was created much earlier than the rest of Chopin's sonatas. The original manuscript carries the date of 28th November 1838. It is the eve of the anniversary of one of the most tragic events in Polish 19th-century history – the November Uprising. Polish emigrants circles in Paris used to commemorate the uprising on the eve of its anniversary and in spite of the fact that there is no evidence that Chopin composed the Funeral March especially for this occasion, the date on the manuscript is unlikely to be a coincidence. Chopin composed the remaining three parts of the sonata right after his return from Mallorca, when George Sand (his longtime friend, lover and caretaker) decided to take him to her country mansion in Nohant, mainly to nurse him back to health. Chopin is still up and down, never exactly good or bad. […] He is gay as soon as he feels a little strength, and when he’s melancholy he goes back to his piano and composes beautiful pages. Yet this allegro is pervaded by the spirit not of a sonata, but of a ballade. Restlessness, mystery, extreme contrasts of expression, subtle sonorities facing sinister sounds. And most of all that propulsion, unusual in a sonata, evoking a horse’s galloping. The jagged and almost hysterical melodies are introduced one by one and are interweaved with only a few-bar-long moments of release which always lead to another culmination; there are cascades of insanely fast octaves and a huge and ponderous cadence finishes of the first part. Chopin never, either publicly or privately, commented on the interdependence of his works. Nevertheless, we have to keep in mind that this part was written soon after his return from Mallorca, where he had moments of despair and thought (prematurely) that his days were numbered. This is why the allegro is often interpreted as a reflection of his struggles with a lethal disease. The subject of death is omnipresent in most of Chopin’s works, and the allegro seems to represent a fight for life. The scherzo’s character is similar to the allegro. Again, it is a game of shocking contrasts of gliding from the most mellow, calm and unforgettable melodies, to the explosive and frenetic etude-like phrases. The most surprising part of the scherzo is its last bars. In a manner unlikely for any final movement, instead of presenting the main theme it quotes a melody that can be found in the middle part of the scherzo – the trio. Moreover, the melody gets lost and is not played to its very end, leaving the listener with a disquieting feeling of uncertainty. The third part is notable not only for having made it into classical music history but also history as such, as well as popular culture. Chopin’s funeral march has become the default go-to musical piece to accompany the subject of death. The intense, grave and overwhelmingly dark ambience of the music leaves no room for ambiguity and has been used to accompany funerals and death scenes for centuries. It was played during Chopin’s burial at Père Lachaise Cemetery in Paris, during the funeral of John F. Kennedy, Sir Winston Churchill and Margaret Thatcher, as well as during Leonid Brezhnev’s last ceremony. It has been used in numerous films, cartoons and computer games and was reinterpreted by many artists including a famous contemporary electronic music producer (Deadmau5’s Moar Ghosts 'n' Stuff) and the renowned singer-songwriter Neil Young (Change Your Mind). The first part of this movement is passionate, with the left hand laying heavy chords in a low register, evoking the sound of a ringing church bell The solemn and heroic melody played by the right hand makes it sound ultimately serious and elegiac. The second part of Funeral March comes with another surprising contrast. Within one bar the movement goes from the darkest mood to the warmest and calmest lullaby with a strikingly simple melody and harmonics. This part brings so much consolation and is so heart-warming that the listener can almost forget about the presence of death lurking around every bar of this movement. However, this ray of hope is soon to be brutally smashed by the return of the first theme finishing with a cadence fading away leaving the listener with nothing but dense silence. His colleagues said that he often played in salons, and the only way to get him to stop playing was to get him to play the March. He was so caught up in the emotions of it. When I was playing my Sonata in B Flat Minor amidst a circle of English friends, an unusual experience befell me. I executed the allegro and scherzo more or less correctly and was just about to start the [funeral] march, when suddenly I saw emerging from the half-opened case of the piano the cursed apparitions that had appeared to me one evening in the Chartreuse [in Mallorca]. I had to go out for a moment to collect myself, after which, without a word, I played on. The Sonata ends as it began, with a riddle, like a Sphinx – with a mocking smile on its lips (…) Music it is not. There is something gigantic in the work which, although it does not elevate and ennoble, being for the most part a purposeless fuming, impresses one powerfully.